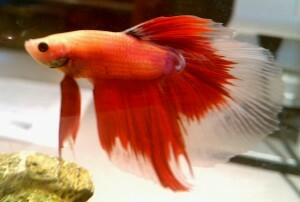 Taking this break from your regularly programmed schedule to introduce the Fish, LunaMetrics’ newest employee. The Fish, who is paid in food and taps on the glass of his aquarium, is our office morale booster. Anyway! Due to my complete inability to find suitable names for things such as blog posts, children and, yes, fish, I’m relinquishing the dubious pleasure of naming our office fish to you, our loyal readers. And in true web marketing fashion, I’m having our fish-naming process take the form of a contest. 3. Sit back and fidget with the suspense of waiting to see if your name gets chosen. Is this a shameless plug for our new awesome Facebook page? Maybe. Will it be worthwhile to participate anyway? Definitely. See, by liking our Facebook page, you’ll become privy to Fan-only tips and tricks and videos that will be posted on that newly-renovated icon of Facebook awesomeness designed and implemented by our own Jim Gianoglio. So even if we don’t use your fish name, you still win. Thanks for helping me name him! He thanks you too!